“No nation can escape its geography” said Percy Spender, the Australian Minister for External Affairs back in 1950. He was talking about the need to reinvent Australia’s relationship towards Asia to make the most out of the nation’s factual geographical position and not see itself only as belonging to the circuits of the old British Empire. This same line of thought obviously applies to cities as well. I got a first-hand experience of this around the turning of the year when I had the pleasure to visit a good friend of mine in Ljubljana, Slovenia. The city naturally wasn’t repositioning its foreign and regional policy like the Aussies were but its relationship with River Ljubljanica. The Slovenian capital was founded on the banks of River Ljubljanica already two millennia ago by the Romans and the settlement has since evolved in close connection with the river. Ljubljanica has always been important to locals as it has represented a meeting point. The banks have brought together people from near and far as well as the world of human settlements with the natural world. Ljubljana geography is rivers and mountains – or “hills” in Slovene perspective. A landmark initiative to celebrate this relationship arose around the 1930s when architect Jože Plečnik “marked the river’s course with a profuse and varied collection of buildings, squares, canals, embankments and riverside parks” to add more “welcoming and cultured monumentalism” to the city’s urban character and to emphasize the role of the river as a key element contributing to the city’s soul (source). The most well-known singular project of his is the unique Triple Bridge. During later decades and with the arrival of socialism and modernism these urbanistic ideas were however gradually forgotten. The riverbanks got turned into roads for motor traffic and parking lots. In post-socialist times, the poor state of the city’s center encouraged suburban sprawl as people voted with their feet (or wheels) and took off to more satisfactory environments at the edge of the city. All in all, by the turn of the millennium Plečnik’s dream of promoting Ljubljana as a people-centered “new Athens” around River Ljubljanica had gone towards the opposite direction altogether. But now that I was there, I’m happy to say I feel like Plečnik has stopped turning in his grave. The greatest asset of the city had been rediscovered. The area around the riverbanks was swarming with people who were enjoying the last days of the “Happy December” festival – a month-long stretch of outdoorsy activities including concerts, food, drinks and more. The weather was the same dark and rainy kind as the one I left behind in Helsinki, but the energy of the two cities were nowhere near comparison. Whereas in Helsinki people generally stick indoors, light candles and hope it was summer soon again around that time of the year, the Ljubljanese mingled among countless hot wine stands and discussed which concert they should go see. With all the activity and beautiful decorations, the atmosphere in the city was quite magical. Without being over-exaggerating. Rainy weather is not an obstacle for Happy December. Hot wine stands are not hard to find. They’re everywhere. Happy December means concerts. A lot of concerts. Prešeren Square in winter time decor. This urban spectacle had undoubtedly not been such a massive success had the city not decided to put forward a collective effort from 2004 onwards to reintroduce Plečnik’s ideas of Ljubljana as a people-friendly place in harmony with the river that defines the city’s geography. In essence, the project has materialized as a refurbishment of the river’s banks, pedestrian zones and strolling paths along the river, five new bridges, and many new landing zones for touristic ships. In recognition for best practice in implementing “urbanistic interventions that promote the public dimension of urban space and its role in social integration”, Ljubljana eventually got awarded the 2012 European Prize for Urban Public Space. A well-deserved win, I say. Naturally, the most important thing are not the physical interventions per se, but the re-discovered culture of planning and its focus to support better urban life. Map of public space transformation projects. source: publicspace.org. Library under the trees. Source: Visit Ljubljana Pinterest boards. New installments. Photo © Jernej Valenčič, source: publicspace.org. New places to just stop and enjoy life. Source: Visit Ljubljana Pinterest boards. New places to stop and just enjoy life. Source: Visit Ljubljana Pinterest boards. Since my excursion to Slovenia, I’ve been thinking about Helsinki’s key geographical features and what kind of role they play within our urban planning praxis. 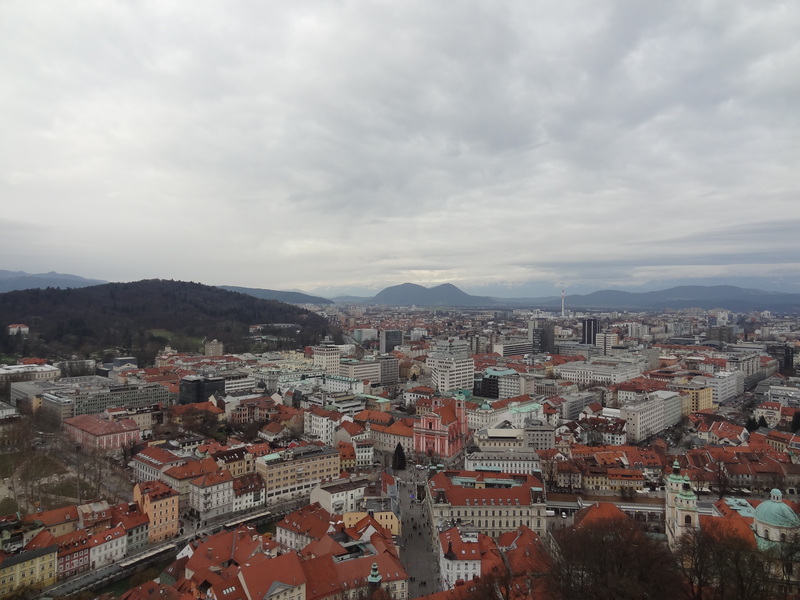 The thing I want to discuss with this blog post is that we have a lot to learn from cities like Ljubljana. As in Ljubljana, water is the main element that defines Helsinki’s soul or identity. 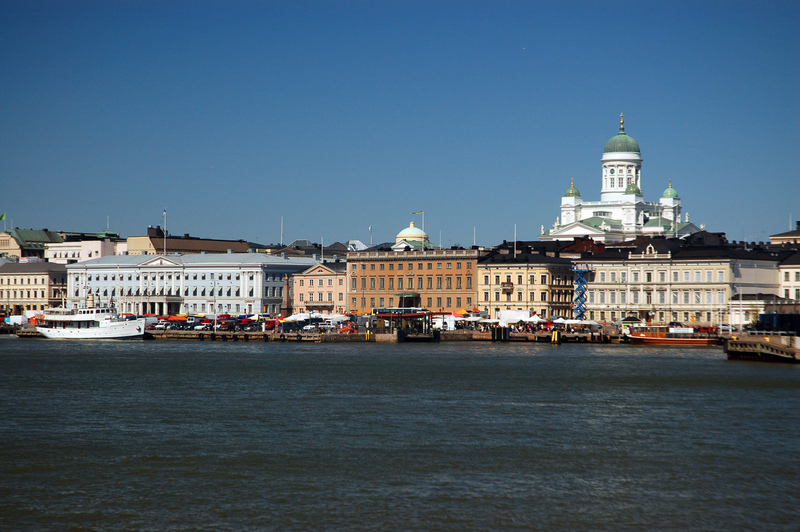 Helsinki is a city built on a peninsula and additionally spreads out to other smaller peninsulas and islands. Just within the borders of Helsinki proper, there are 317 islands and altogether 122.5km of coastline. There’s no lack of sea in Helsinki. Map courtesy of Google. Respective to this geography, Helsinki has a very maritime-centered history. The city was originally founded to compete with Tallinn which was a major hub for the Hanseatic League at the time. Later on, Helsinki grew in conjunction with the development of the Suomenlinna maritime fortress which was established as a strategic Baltic Sea stronghold just in front of the city. After the Russians beat the Swedes over the control of Finland in 1809, they moved the territory’s capital from Turku to Helsinki as it would then be a shorter sail away from St. Petersburg. The Tsar ordered the move to be followed by the establishment of an empire style center for the city at the southern tip of the peninsula where the settlement of Helsinki laid on. Throughout its history, Helsinki developed as a center for seafaring and ship-building. More contemporary icons of this identity are Helsinki’s locally-produced majestic icebreaker ships that watch over the city anchored in Katajanokka. Following this history, Helsinki has evolved to be known as the “Daughter of the Baltic Sea”. The key spatial manifestation of this narrative is embedded in the city’s maritime silhouette and more specifically in the general area of the South Harbor. This urban space has been elevated among the Ministry of the Environment’s “27 national landscapes of Finland” which “represent the special environmental and cultural features of the country”. Key selection criteria are that the “landscapes have great symbolic value and widely recognized significance in cultural and historical terms”. Helsinki’s South Harbor. View towards Market Square. Photo source: Wikimedia Commons. Indeed, the South Harbor acts as a stage where the urban truly meets the sea; a place where you can experience the city and the sea at the same time. For one thing, the view is fantastic when you approach the city from the sea. These days ferry passengers from Stockholm and Tallinn as well as occasional cruise tourists get to experience this terrific welcoming before they embark to explore and enjoy the city. In local perspective, besides boating to neighboring countries, we most often visit the area in summer to take a ferry ride for a picnic in Suomenlinna or just to sit at the Market Square for a coffee and enjoy the constantly growing tourist crowd. 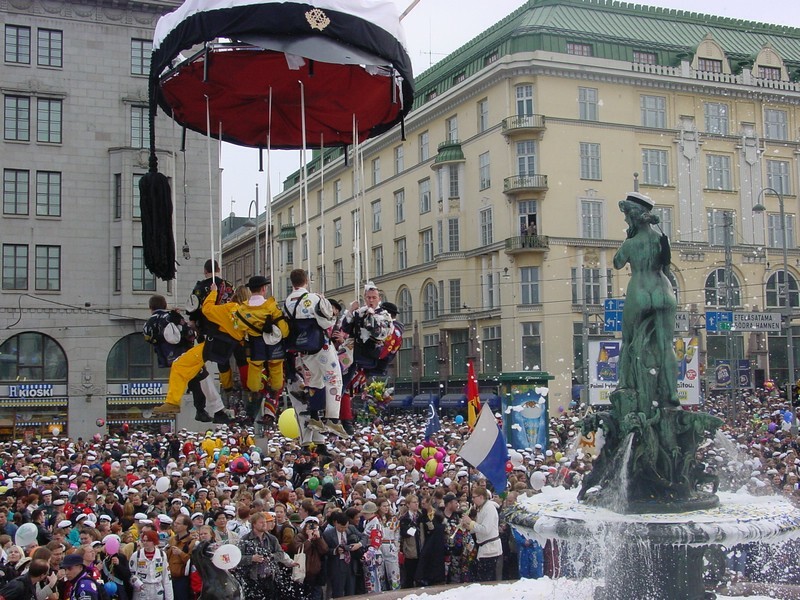 Annually, we kick off the summer season by celebrating May Day (Vappu) and part of the tradition is to get the party going by placing a cap on Havis Amanda, a statue of a mermaid which symbolizes Helsinki’s maritime identity. Also if something extraordinary happens nationally – like we manage to win at the ice hockey world championships or the Eurovision song contest – the Market Square is where the celebrations take place. Havis Amanda getting her cap on during Vappu celebrations. Photo source: Wikimedia Commons. However, despite Helsinki’s long-standing identity and narrative of a “city born from the sea”, this in reality remains the only larger area where you can sense an ongoing relationship between the city and the sea. If we look beyond the South Harbor, the concept of a city projecting its maritime identity is fuzzy to say the least. Let me speak from my experience. I’ve lived in Helsinki since 2002 and for the most part in the inner city and around 0.5km from the sea. Yet in everyday life, I meet the sea very rarely and usually only in summer. The times when I most often do is when at the South Harbor taking part in one of the above-mentioned activities; when in summer I go to the beach to play beach volley or just chill out; hang around in the general area of Kaivopuisto; or when I go jogging to Mustikkamaa, a recreational island close to where I live. Funnily enough, always when I go there I take the metro to avoid jogging twice along a six-lane highway which is the only way to get there on foot. The point is that the sea isn’t an element in the stages for urban life for the average Helsinki inhabitant despite the city’s geography and active image construction. You might catch a glimpse here or there when traveling by public transport or car and crossing a bridge or moving along one of the major arteries built along the water, but there are very few places where everyday life sort of naturally happens by the sea or where the city even opens up towards the sea. This is view of maritime Helsinki many are familiar with. That’s because they see it from a train when arriving to Helsinki. I see two main explanations for this. One reason is that as the city has grown and industrialized, more space has been created for the city with landfills and by connecting islands. The word “saari” means an island in Finnish and if you read the city map you can spot names ending with “saari” but marked in areas that are not islands anymore. With this landfill business, the coastline has gradually moved further away from the zones of everyday life for regular people. And additionally with the rise of cars and car-focused planning, roads and parking facilities have been built along the seashores – similar to what had happened in Ljubljana. The result are obscure no-man’s-land type of places where traffic zones, pedestrian ways and park-like features are all mixed randomly together. These kind of maritime Helsinki zones are generally found around the inner city. My closest access point to the sea underscores this face of Helsinki (see gallery below). The other key reason for Helsinki’s lack of maritime urban spaces is our narrow understanding of the word “recreation”. This is specifically portrayed in the areas outside of the inner city where the most of the coastline is either zoned to act as a green buffer zone between the sea and built-up areas or just plain forest. In either case, the coastline has been cemented to serve recreational purposes. But the way things are done it’s those who own dogs who probably get to see the sea the most. For the rest it means including jogging or the like to your weekly agenda. There are only very few points where the urban fabric comes near the water so you’ll have no other chance or reason to encounter it. This kind of maritime Helsinki is generally also a product of modernist planning thought. Following the Tapiola model, it was 60 years ago decided that the ideal city should A) separate land uses from each other and B) interfere with the natural landscape as little as possible. A bit like our own interpretation of Frank Lloyd Wright’s Broadacre City concept where the city dissolves and disappears into nature. Take a peek out of the window next time you’re flying to Helsinki and you’ll see what I mean. It’s fair to say that we’ve come a long way from the original concept of a maritime Helsinki that was founded around the Empire center. Since those days, the population of the metropolitan area has gone up from a few thousand to around 1.1 million but for the most of them it’s sadly still the only place to experience life “Daughter of the Baltic Sea” style in an urban setting. And even the South Harbor has been suffering from the Ljubljana disease. Over time, through traffic has increased in this part of town too and parts of the harbor area function as parking lots. Due to criticism about the state of the South Harbor, the city held an idea competition in 2011 to develop the area. Not much has happened since, but preliminary plans include introducing a Guggenheim museum and an outdoor sea pool complex to create new anchors for the harbor area. First class parking lot at the South Harbor. As the city is projected to grow drastically in the upcoming years, now is the time to re-imagine new ways and locations for how and where Helsinki and the Baltic Sea could gracefully blend into one another. This thankfully is one of the themes the City Planning Department is reviewing for its new city plan project. One preliminary thought is to consider ways of adding more urban outlets where people can consume maritime atmospheres. That’s a welcome start, but please start fresh altogether. New neighborhoods built relatively recently or under construction now at coastal locations are living proof of the fact that we need to reboot the ways we connect the city and the sea if we want to make stages for urban life that are capable of supporting anywhere near of what is happening in Ljubljana. 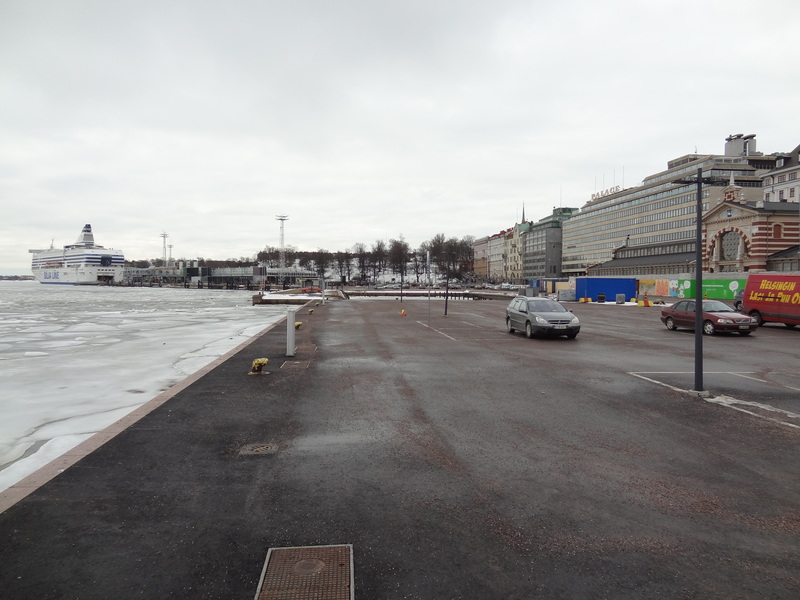 In older projects with some effort of doing so, such as Ruoholahti, Herttoniemenranta and Aurinkolahti, the stages are empty for the most part. There practically is very little reason for the public to visit these locations. The only times I’ve had reasons to go is when a friend of mine has taken me for boat rides. In Ruoholahti it’s easy to get on or off as its “maritime plaza” is close to a metro station. In Herttoniemenranta we stopped for a beer. Not because we specifically wanted to, but it was the only place where that was possible. This I guess is the kind of maritime urban life the city expects people are enjoying, but in reality it personally happens about once per summer. The overwhelming majority of us are stuck with jogging in the woods. Aurinkolahti in the very east of Helsinki has the same faults apart from summer time. That’s because it has a great beach which fills the area on warm days. This deserves recognition for good planning practice, but still as a whole Aurinkolahti could have been much more diverse and livelier. Aurinkolahti can get crowded in summer. Picture source: Wikimedia Commons. In the winter, not so much. Current projects also don’t promise a turn for the better. At the obsolete harbor areas of Jätkäsaari and Kalasatama, the first installations of urban fabric don’t exactly stand to create an atmosphere where the city opens up to the sea by the looks of it. The areas are of course not yet finished, but I haven’t seen any clues that would make me expect something out of the ordinary. One day I hope I’ll be able to make spontaneous plans of meeting people or just going for a walk and I’ll have the Baltic Sea and the city to admire while doing so. We definitely shouldn’t escape our geography and, even more importantly, we should make the most out of it. Ljubljana’s example shows that despite uncomfortable weather conditions people are eager to be actors in a play of vibrant urban life when the stage and script are done right. In addition to urban design that’s inclusive of the shoreline I’d also like to see more mixed-use development in places like Jätkäsaari and Kalasatama to attract people to the area. With the exceptions of Kallio and a few other central neighborhoods, a lot of beautiful areas are purely residential because (presumably) that’s all the zoning allows for. Dense residential areas are great, but in order to become truly vibrant and lively neighborhoods there needs to be street-level retail and leisure opportunities. It would be fantastic to make use of the abandoned, sea-facing space in Jätkäsaari and Kalasatama with shops, bars, and restaurants. Instead of just being a nice-looking, reasonably dense, new neighborhood, the only way these neighborhoods are going to be truly successful is if they’re made into destinations in and of themselves. I couldn’t agree with you more. Thanks for the input! I find it mocking the readers’ intellect to compare the weather in these two cities. 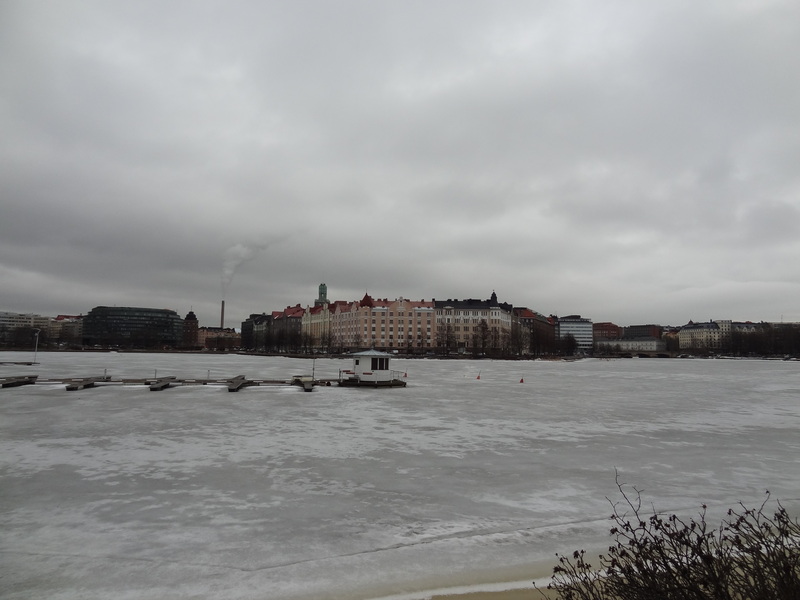 They have five calendar months where the average temp is over 15, Helsinki only has two. And, more importantly, the chilling (freezing) wind from the open sea is a pretty good reason to turn our backs to the sea, with buildings protecting the overburdened citizens, unless it happens to be the rare, warm and calm summer day. The point is that in December the weather for example is fairly comparable. In any case it’s not like it is generally just nice to stand outside in Ljubljana in winter. But people still do despite of this when the setting and atmosphere are right. People also do this in Finland and in much colder weather when there is some other interest involved. We have outdoors Christmas markets and sports events that people attend and spend time outside. The point being, cold weather is not an obstacle that cannot be surpassed but something creative minds have to focus on. The same goes for the chilling wind. We naturally can’t copy much of what they did in Ljubljana physically, but we sure can use the same spirit and and approach to developing our cities.